My cousin and her family hosted a small family wedding for her younger brother and his bride in their new backyard yesterday, and it turned out to be one of the most beautiful and special weddings I've had the pleasure of attending. 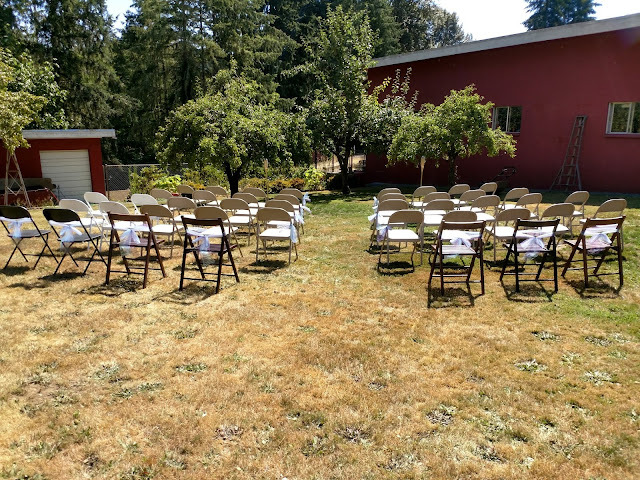 The wedding was very short notice, and the whole family put in a lot of hard work this past week to ensure everything came together in time for the ceremony. 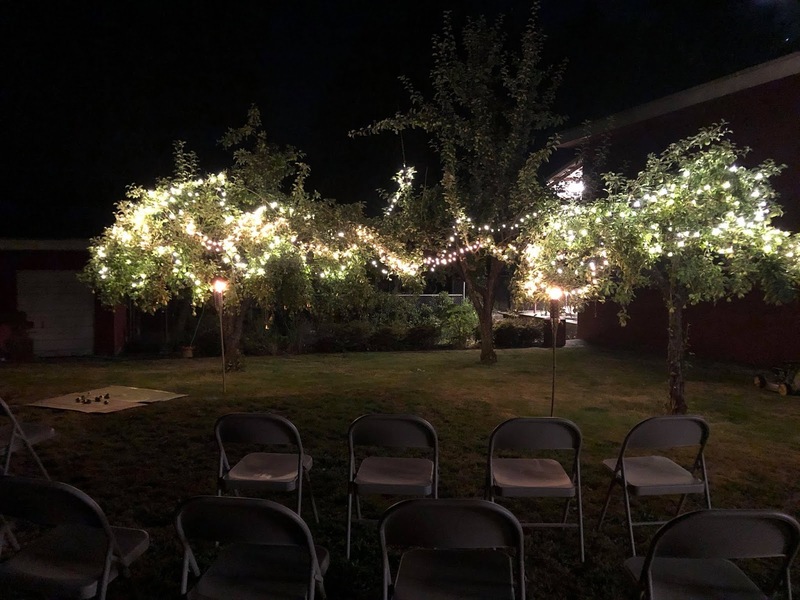 We hung white lights everywhere and set up folding chairs on the lawn facing the little orchard where the bride painted some of the low hanging pears gold for a stunning effect. We tied blooms white lights to the rhododendron bush, its own buds long since wilted away for the year. 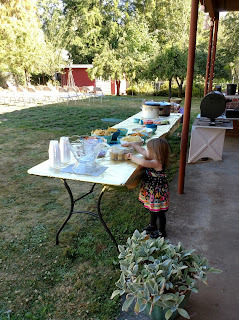 We set up tables and decorated with empty wine bottles. We created a firepit off to the side where we lingered long after vows had been exchanged and the filling potluck meal had been eaten and the cake cut. It was a beautiful summer day, sunny and warm with a slight breeze. 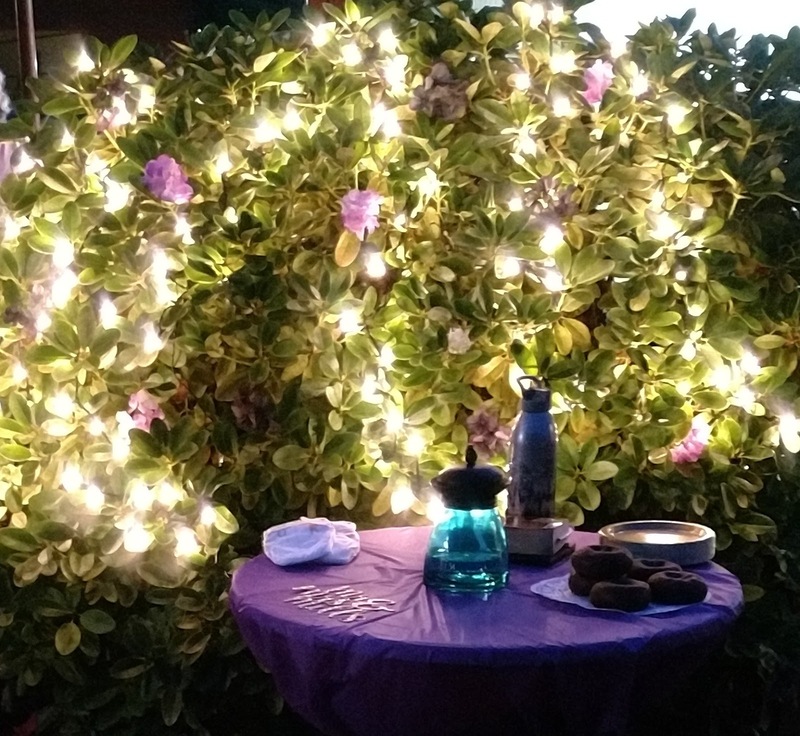 As the sun set, the string lights added a romantic glow with soft music playing in the background and the fire to keep us warm. It was one of the most memorable nights I've ever experienced, and I'm reminded once again how much beauty there can be in the small and the simple parts of life. Sometimes we get so hung up on making everything bigger and better and more elaborate that we forget that sometimes simple and understated can be just as stunning and perfect. This is true about so many things in life, whether it's a wedding or even a home. If you have room for the things and people you love most, that's all you really need in this beautiful life.